Tesla initially went public in 2010 and currently has a market value of $61 billion. At a share price of $420, the company would be worth around $71.6 billion. 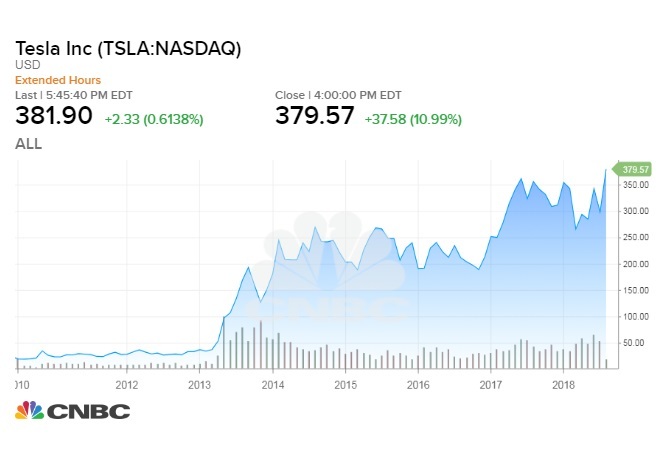 If you had invested in Tesla in 2010, when it made its initial public offering, that investment would certainly have paid off: Tesla stock is currently more than 2,000 percent higher than its IPO price of $17. That means a $1,000 investment in the company then would be worth $22,327 as of August 7, 2018, according to CNBC calculations, or more than 21 times as much. Despite Tesla's progress, any individual stock can over- or under-perform and past returns do not predict future results. In response to his first tweet, Musk said that he will ensure the prosperity of shareholders "in any scenario." If Tesla went private, current investors could keep their stakes in Tesla through a special fund, or sell their shares at $420, he said. Musk later shared a blog post on Tesla's website detailing his rationale for taking the company private, although the letter also says "a final decision has not yet been made." The post makes no mention of the funding Musk said he had secured in his original tweet. Going private would remove the public spotlight from the company, which has been burning through cash and struggling to meet production targets, according to CNBC's Robert Ferris. As a public company, Tesla is beholden to shareholders and required to report quarterly earnings, which Musk said puts "enormous pressure on Tesla to make decisions that may be right for a given quarter, but not necessarily right for the long-term." The decision is ultimately up to shareholders, Musk said. "Investor support is confirmed," he wrote on Twitter. "Only reason why this is not certain is that it's contingent on a shareholder vote." If you're considering investing in Tesla or in the stock market in general, experts advise starting slow. Experienced investors Warren Buffett, Mark Cuban and Tony Robbins suggest beginning with index funds, which hold every stock in an index, offer low turnover rates, attendant fees and tax bills, and fluctuate with the market to eliminate the risk of picking individual stocks. This is an updated version of a previously published article .